A voice in the prologue, in the dialect cadences of the slave narratives, introduces the stark opening image of a black man, roped and bloodied, dragged by two white men on horseback—the paddy rollers. Eight-year-old Sadie Crosswhite is forced to watch with her parents and siblings as their beloved friend, January Drumm, is whipped and carried off for burial, the price for trying to run away. 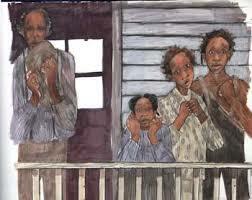 Sadie and her family run away that night, stopping in Marshall, Mich., with its free black community. They tell no one that they are runaways, as harboring them is against the law. The slave catchers track the Crosswhites down some four years later, in 1847, and in a blazing scene the townspeople of Marshall, black and white, defy them, even as January himself appears, baring his horribly scarred back. 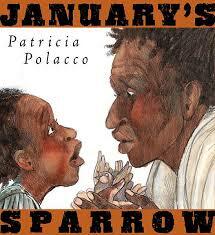 After reading write a Poem For Two Voices by creating your own poem from the perspectives of both Sadie and a Slave Catcher.